Munich was at the tail end of our trip. We took an overnight train from Paris so we had 2 full days and two nights there. 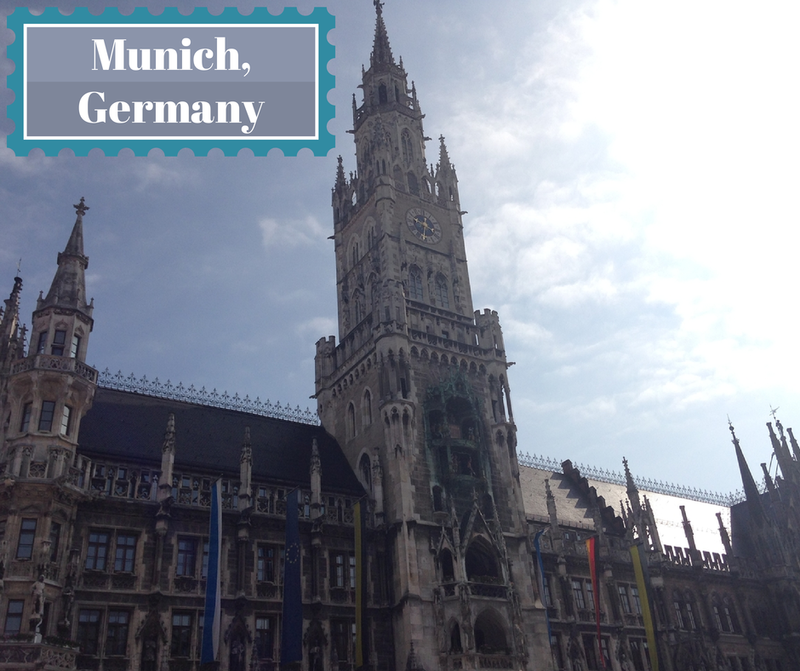 I loved Munich. The people were very friendly and I got to try a lot of new things! Its a city rich with history and concerned about preserving it, which is so important. After my taste of Germany, I hope to go back to see more of the country. This place was great because it was across the street from the train station. When we arrived by train we were able to drop off our bags right away and when we left, we were able to take a short train to the airport. Much like in Nice, it was a hostel, but we stayed in a private room. It was a few floors above the other rooms and brand new so it was a lot quieter and very clean. This hostel also had a great bar where we met some other travelers. They also had a glass-roofed courtyard with chairs and hammocks, which was nice to relax on when we arrived early our first morning. It was also near some metro stops, but we ended up walking everywhere because it was only about 10 minutes to Marienplatz. Took a bike tour with Mike's Bike Tours----I can't recommend this enough. We learned so much from riding around the city like the locals (they have bike lanes). We saw many WWII historical places and also stopped at a biergarten. We even got a discount for staying in a hostel. Chinese Tower Biergarten: When in Munich you must try the beer. My favorite ended up being the Bavarian Wheat Beer. I also really liked Radler, which is a beer and lemonade mix. While at the biergarten we also tried some traditional German food. Its pretty much meat and potatoes. At the biergarten we had fries and tried several different meats such as a meatball, half a roast chicken, and bratwurst. Yum2Take Thai Eatery: My German friend took us here. 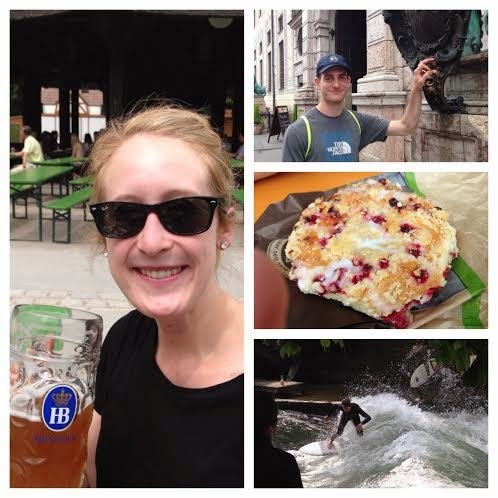 She informed us that most Germans don't eat traditional German food on a daily basis. She loves to eat Italian, asian, ect. just like we do. We ordered from a menu and we were able to take it and eat outside. 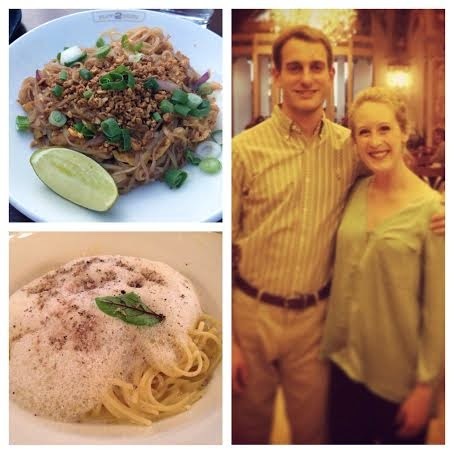 I had some fabulous pad thai and Matt loved his red curry. Schuhbeck's Orlando: My German friend also informed us about Alfons Schubeck, a famous German chef! He owns most of the square around Hofbrauhaus and has several restaurants and stores. We went to dinner at Orlando, his upscale restaurant. I was nervous that it was going to expensive since everyone kept telling me that Munich is the most expensive city in Germany, but compared to Paris it was not at all. I got a fancy meal for under 20 euro! I had some lovely Truffle Linguine. We even got to see the famous chef walking around! Schubeck's Eissalon: Located conveniently next door is Schubeck's ice cream shop. He has some very fabulous flavors. During our time there I tried chocolate strawberry as well as mint. Very delish. See my other recent posts on Geneva, Nice, and Paris!